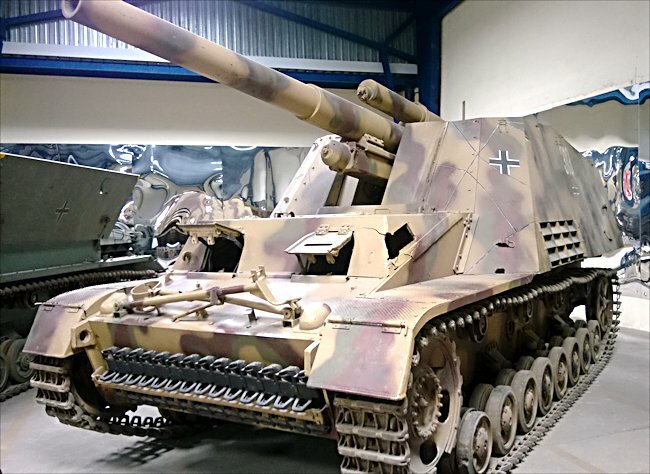 This German Hummel 150mm schwere Panzerhaubitze auf Geschützwagen III und IV (Sf.) self propelled artillery gun (Sd.Kfz. 165) can be found at the French Tank Museum in Saumur in the Loire Valley. The Museum is called Musée des Blindés ou Association des Amis du Musée des Blindés, 1043, route de Fontevraud, 49400 Saumur, France www.museedesblindes.fr . The word Blindés means armoured. 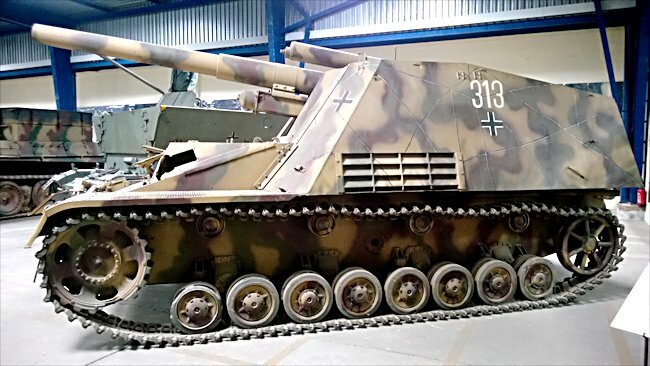 German Hummel self propelled artillery 150mm gun. This was not a tank destroyer. It was knocked out by tanks of the 5th US Armored Division on 10 August 1944, near the farm “Les Noyers”, Nouans, Sarthe, France. It was part of 9 Panzer Division. The battery number should be 6313 not 313. Each Panzer division had three battalions of artillery, of which one was heavy. Each with three batteries four guns, towed by eight ton half track. Whilst the speed that the half tracks could bring the heavy weapons up to the front line was impressive, it could take 30 min for the gun crews to make the weapon ready for firing. Was trying to fight off a counter-attack, this could be too long. The performance of the gun was good. They were able to fire a shell of 43 kg out to 13,000 m. What the Panzer divisions required was a fully tracked vehicle that could mount a 150mm gun that could be deployed instantly. They had to wait until 1943 when the Hummel was introduced to the Russian battlefield during operation Citadel. The standard 15 cm sFH 18 L/30 howitzer was mounted on the specially designed Geschützwagen III/IV tank chassis. It took elements of both the Panzer III (driving and steering system) and Panzer IV tank chassis (suspension and engine). The engine had been repositioned to the centre of the vehicle to make room for the gun and crew compartment. 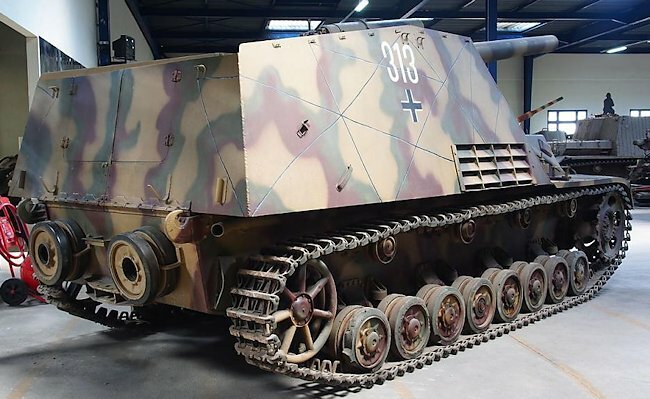 This same chassis was used on the Nashorn tank destroyer. Early Hummel's can be recognised by the drivers compartment that stood proud of the front sloping armoured plate. In later models, this compartment was extended across the whole front of the vehicle. When the 150 mm howitzer gun was not in use, it was locked in place by the large brackets attached to the front armoured plate. Like all German self-propelled guns at this time, the crew and gun compartment was open topped. The Hummel was a mobile artillery gun not a tank destroyer. The problems of fighting vehicle that had light armour and open to the elements was not so risky. It was designed to be used some distance away from the front line. 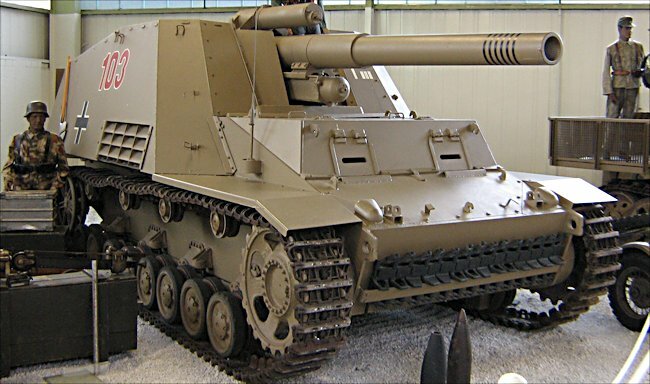 Initially only six Hummel's were issued to each Panzer division's artillery battalions (Panzerartillerie Abteilungen). The Hummel only carried 18 rounds of ammunition. It needed to be regularly resupplied. A number of Hummel's were made into ammunition supply vehicles. It was the same vehicle, without the gun, but fitted with ammunition racks. In an emergency a battlefield conversion could take place and a 150mm gun fitted. The availability of the Hummel gave the Panzer Divisions the heavy punch they needed when mounting counter-attacks. They were never enough Hummel's to satisfy the demand for this type of weapon. Often Hummel's were seen to be firing alongside the smaller Wespe self-propelled 105mm guns. By the time production ended in 1944, 714 Hummel's and 150 Munitionsträger Hummel resupply vehicles have been produced. This is another late production Hummel. It is located in the Auto and Technik Museum in Sinsheim, Germany. I have found no known photos of 2. Pz. Hummels nor any information about their markings. According to Dugdale (Vol. I, Pg. 35) 2. Panzer reported 2 Hummels on hand on Sept. 5, 1944, so at least two made it over the Seine. Ledwoch (Pg. 20 and 26) attributes two photos to 2. Panzer in Normandy but I highly doubt the accuracy of these captions as the first one is a well-known photo that has always been attributed to the Eastern front (per Allied-Axis it belongs to Grossdeutschland). According to Dugdale (Vol. I, Pg. 41) 9th Panzer was actually allocated two batteries of Hummels. On Sept. 1, 1944 the Division reported 7 Hummels on hand, including two in short-term repair. Scherzer (Pg. 1) indicates that originally (November 1943) the II. Abteilung was composed of 4. and 5. Batteries equipped with Wespes and 6. Battery equipped with Hummels, but as of May 1944, the self-propelled battery was changed to the I. Abteilung and the 1. and 2. Batteries were equipped with Hummels, the 3. with Wespes. According to Zetterling (Pg. 330) on June 15, 1944 9. Pz had 6 Hummels on hand and was short 0. He cites "Pz.Gr. West Ia Nr, 2592/44 g.Kdos., Meldung über Stand der Neuaufstellung (Stand 15.6), H.Qu, den 21. June 1944" as the source for this information. According to this Gliederung, the 3. Batterie had 6 vehicles and 1. and 2. Batteries were still being equipped. According to Leonard Paul, who kindly forwarded this gliederung to me, the July gliederung reflects the same composition. Also of interest is the written note showing that there were 2 Beobachtungs Panzer IIIs, 6 Hummels, 4 Munitionträger Hummels and 2 Munitionträger Wespes on strength in the I. Abteilung.